On November 10, His Holiness Karekin II, Supreme Patriarch and Catholicos of All Armenians, received Mr. Mario Mazzola, Senior Vice President of Cisco Systems; in the Mother See. He was accompanied by Dr. Hovik Musayelyan, Director of the Synopsys Armenia Company. At the meeting His Holiness noted his appreciation for the important contributions made by the company led by Mario Mazzola, in the development field of information technologies. His Holiness also expressed his congratulations that this year, Mr. Mazzola would be the recipient of a Presidential Award for advancements in the global IT industry, awarded by the President of Armenia, Serzh Sarkisyan. The Catholicos of All Armenians stressed that Mr. Mazzola’s presence in Armenia will have great benefits and create enthusiasm among young professionals. Mr. Mario Mazzola expressed his heart-felt appreciation, noting that during his time spent in Armenia, he has felt the warmth of the Armenian people everywhere. The Senior Vice President of Cisco Systems noted that it was a great honor to be receiving such an award. 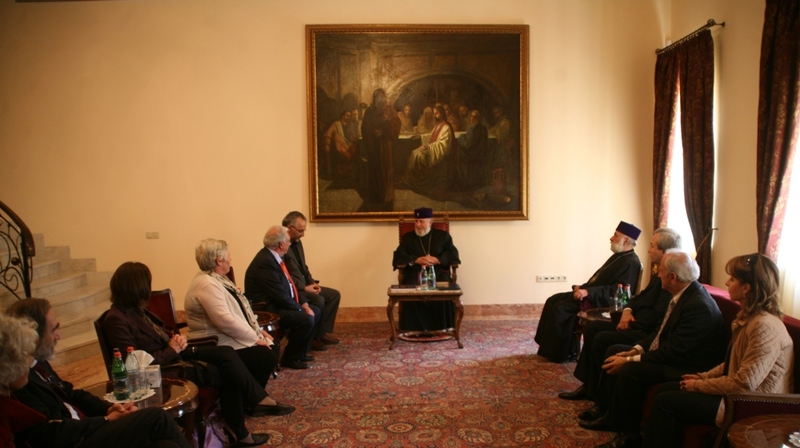 During the meeting, reference was made to the mission of the Armenian Church in the life of Armenians, particularly noting the support of the Church to science and culture figures. The Catholicos of All Armenians and Mr. Mario Mazzola also spoke about the events scheduled for the commemoration of the 100th anniversary of the Armenian Genocide.